When it comes to stepping up to the plate, we know an awful lot of kids who know how to do it just right. This week, we celebrated the second annual Step Up to the Plate for Grace games between the Lincolnwood High School Lancers and the Morrisonville High School Mohawks. Despite some iffy weather, the teams managed to get back-to-back games scheduled on Thursday and Friday, and we were so humbled. Coach Montgomery presented us with a new commemorative plate, designed by Lela Ferrill. The fundraiser was started last year by the two schools in April, and we were so excited when they decided to do it again this year. Last year, Kyle and I got red (Morrisonville) shirts for the games, so this year we got black ones for Lincolnwood. My collection of Grace shirts is steadily growing, and I wear one nearly every single day! Throwing out the first official pitch! Catcher Johnny Davidson gave us the ball, and then all the players signed it! The first of the games this year was schedule in Raymond on Tuesday, but an afternoon thunderstorm postponed the game. And despite a very wet Wednesday night, Coach Bob Montgomery said they were going to do everything in their power to get the field ready for Thursday's game. 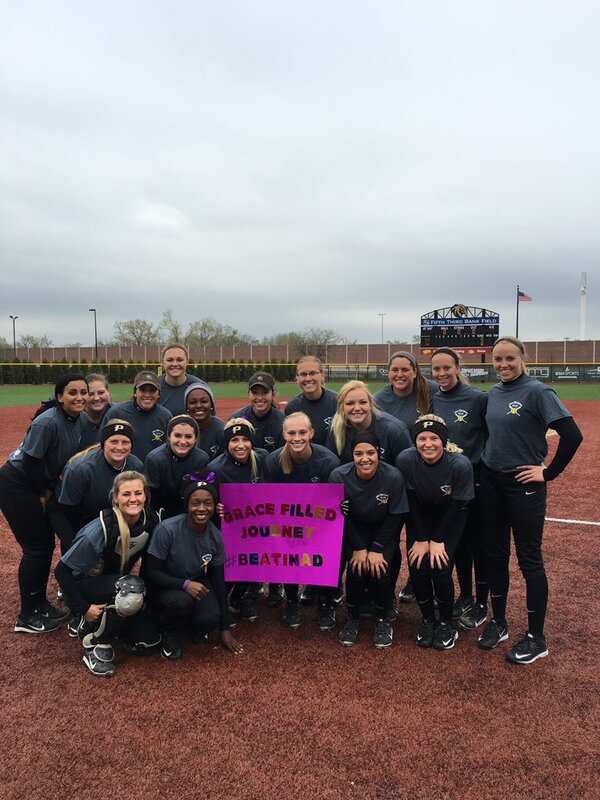 Both teams ready to Step Up to the Plate for Grace. Grace was written just behind home plate. And true to his word, it was ready to go on a beautiful Thursday afternoon. Grace was scheduled to throw out the first pitch on Thursday, and we arrived JUST in time for the start of the game. Actually, I think they might have been waiting for us to get there. But we made it! Grace and I snuggled during the National Anthem. We loved seeing the players in their Grace jerseys. We walked onto the field, and they had painted Grace's name in chalk just behind home plate. Coach Montgomery gave me the ball, and told me the catcher, Johnny Davidson, had been waiting all day to catch Grace's toss, which definitely made this momma smile. Since Grace can't really toss the ball herself, she and I walked about halfway to the pitcher's mound, and I set her on my knee, and made the toss, which only bounced slightly in the dirt before being nabbed by the catcher. Davidson gave us the ball, which we asked the Mohawk team to sign, so we could add to Grace's collection. After posing for a photo with both teams and the National Anthem, we made our way to the pavilion to watch the game. It was a nice spot in the shade, and Grace and I hung out while Kyle took some action shots for the paper. Kyle and Grace watching the agme. In addition to the first pitch, the team also hosted several fundraisers for INAD research, including shirt sales, concession stand sales and a 50/50 ball toss after the fifth inning. We quickly picked up five balls for the ball toss, and held onto them in Grace's stroller. Midway through the third inning or so, Grace, who opted out of a nap that afternoon, was starting to get tired. Shortly after pulling her onto my lap, she managed to fall asleep, and we snuggled for the rest of the game. Kyle was gracious enough to throw all five of our balls during the 50/50 toss (and said he only threw his arm out a little). He also brought us some delicious dinner from the concession stand. The first night, it was the Mohawks who took home the win on this Grace-Filled Journey, and we loved being a part of such a special game. Since Tuesday's original game was rained out, Lincolnwood and Morrisonville did some schedule changes, and decided to play back-to-back games. So, on Friday, we headed to Raymond for the second half of the Step Up to the Plate for Grace games! Throwing out the first pitch at the Lincolnwood game! Once again, we arrived a little too close to the start time, but they were ready for Grace and I to throw out the first pitch to team captain Reese Snyder. For the second day in a row, Grace and I walked about halfway to the pitcher's mound, and although our pitch still managed to land in the dirt, everyone cheered for us! We're going to add the ball we pitched out to her collection. Both teams ready for another Step Up to the Plate for Grace game. As we made our way to home plate for another team photo, we saw the team had spray painted #BeatINAD in the grass behind home plate. It's so inspiring to us to see all the people who rally around our beautiful little girl, and to help us raise more awareness about this terrible disease. For this game, my mom and dad had a chance to come and see us throw out the first pitch, and Kyle's dad came a little later, and we all enjoyed watching the baseball game together. Grace sat on Grandma Susie's lap for most of the game, and really seemed to enjoy herself. And for the second night, the Lancers picked up the win! Snuggling with Grandma and Grandpa Galer. The Lincolnwood team also offered shirt sales and half of its concessions proceeds to benefit the INAD research study. Both teams plan to present a check to us during regional play later this spring. And if these two games weren't enough, we had another surprise awaiting us. 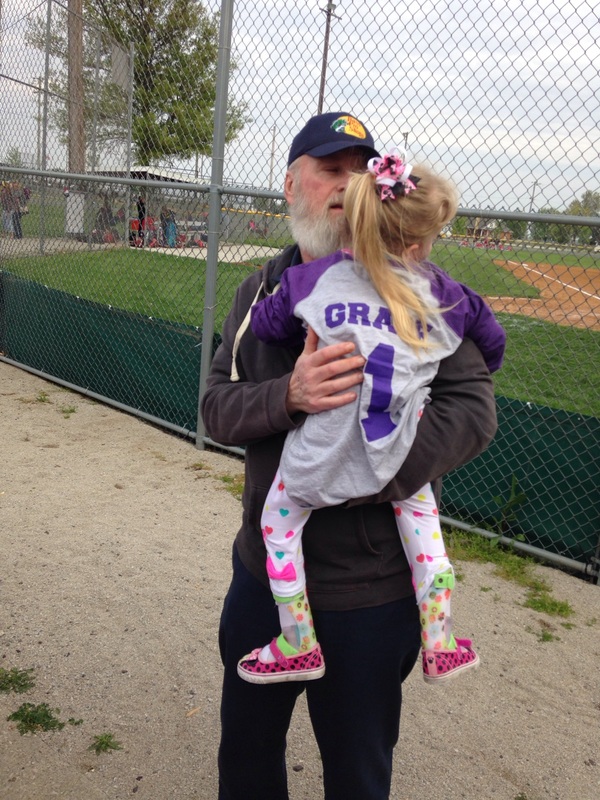 Earlier this year, Marty and Kara Steffens bought enough of the county baseball tournament Grace shirts for the entire Purdue Calumet college softball team, where their daughter, Tessa, is a freshman. The team planned to use them for warm-ups this season. Members of the Purdue Calumet softball team before their Grace game this week. We found out just this week that the team was also planning a special Grace-Filled Journey game on Thursday. Since they play all their home games in Hammond, IN, it was a little far for us to go this time around, but we definitely enjoyed the photos they posted on Twitter after the game. 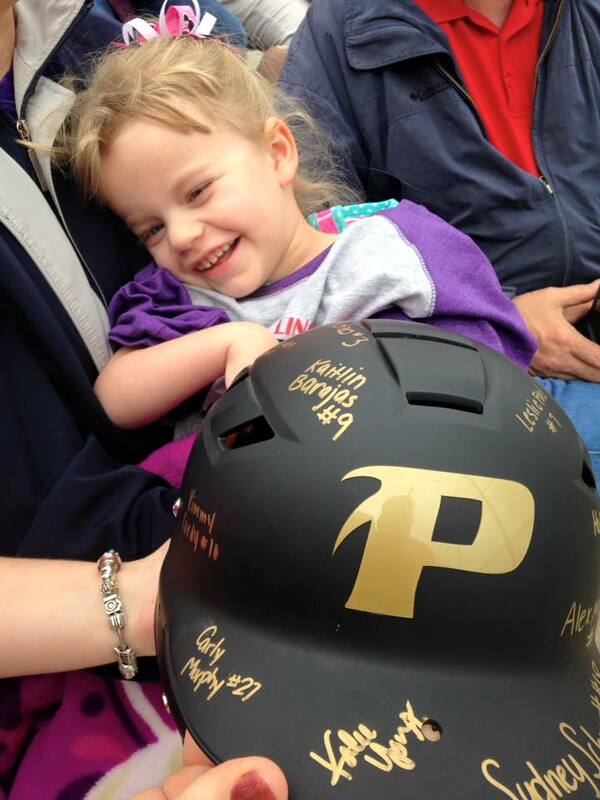 Marty brought Grace a poster and a signed helmet! Grace was really excited about her new helmet, and we read all the names to her! And as another surprise, Marty showed up at the baseball game in Raymond to present us with the poster they made for the game, as well as a signed helmet (donated by Schutt Sports in Litchfield), that had the names and numbers of all the girls on Tessa's team. You won't want to miss Grace's sports memorabilia display when we get the living room fixed up this summer! Life on this journey can be hard. But I'm here to tell you, that thanks to our community of wonderful, loving, generous people, the good days WAY outnumber the bad ones. Thanks for stepping up to the plate for our Grace. We'll never forget it.